I provided a quick review of the latest update to Drafts for iOS yesterday. Within hours there was an update to a similar app, Scratch.1 Of course, I took a look. Scratch is one of a new generation of iOS apps, the quick entry apps. Drafts and Launch Center Pro are good examples and I like where this trend is going. Until Drafts and Scratch, an index card was the fastest way for me to take a note.2 Now, that's flipped around because I always have my iPhone in my pocket, whereas I usually need to hunt for my index cards and pen (or at least I have to reach further for them). By its nature a note app must be fast. It must launch fast and let me enter a note within a second. It must also let me leave the app just as quickly without needing to sync or fiddle. A splash screen is an admission of defeat and I want no part of it. Scratch has a unique design. It's simple but provides a lot of functionality if you know where to look. Scratch provides a single bar above the keyboard that slides left or right to expose special Markdown keys, action menus or the settings. It took some time before I was comfortable with it but now it feels just fine. Scratch is a competent competitor to Drafts and beats it in some ways. Drafts is great and is the clear winner on the iPad. But for my workflow I prefer Scratch on iPhone. Scratch has a small set of actions but what it does have works better than Drafts. 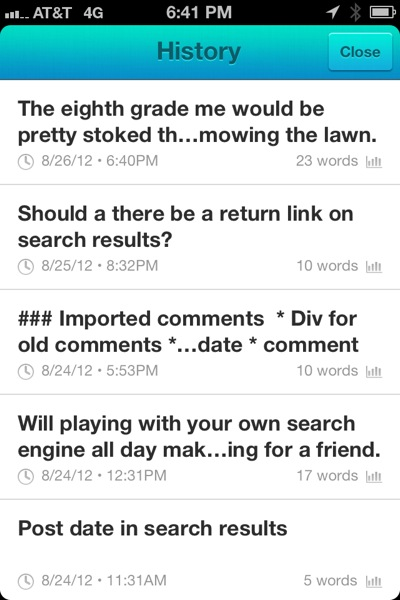 Drafts, however, is more flexible and provides many more pathways to use text from within the app. Scratch only provides six actions. The append to Dropbox function in Scratch was greatly improved in this last update. Scratch remembers the list of recent Dropbox files that I append to. Appending to any of my "favorites" is just three taps away. I'd still prefer it to be only one tap, but that would be petty. Scratch also remembers my most recently used Dropbox folders for adding new notes, which alleviates my complaints about the previous version, which required browsing for a place to store every new note. Like Drafts, Scratch keeps a running list of notes I have created, regardless of how I used them. I rarely use this feature. 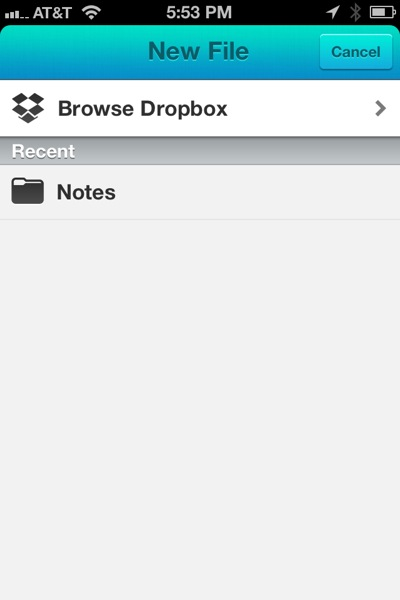 Once I create a note, it goes into Dropbox and I'm done with it. 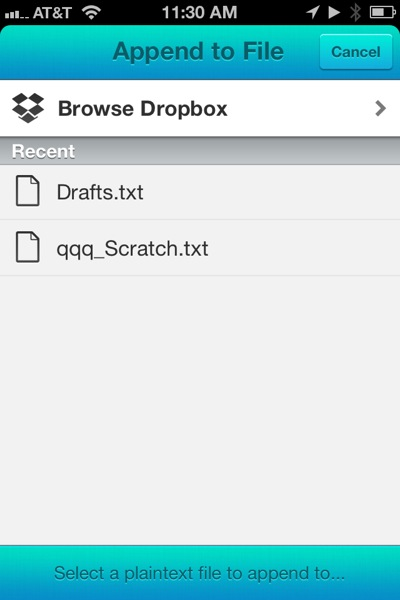 Scratch is also a great app for quickly adding notes to Dropbox. I type some text and hit the action key to upload to my Notes folder on Dropbox. Scratch remembers my favorite Dropbox folders and will also name the files for me. Scratch really leans hard on Markdown. There are many shortcuts for entering lists, links and headers. For someone like me, it works great and makes it even faster to enter a quick note. It can get in the way though. If I don't need Markdown for a note, I must slide the bar around to get to the action menu. There are nice options in addition to just shortcuts. Many of the Markdown keys work on selected text as well as simply adding markup characters. MD smart lists auto-continue on new lines and the H-header automatically adds a space after the last hash symbol. The keys are more than simple text expansions. Many of the quick entry apps still have too many speed bumps. I like Scratch's option to auto-title my notes without asking, but I would prefer if I could define how it names a note. The Scratch convention is "Scratch YYYY-MM-DD at HH.MM.SS PM" which is not how I name notes.3 At least it includes a common word and a time stamp which means I can find these little notes with one simple search. I really like how Scratch remembers my most recently used Dropbox text files and folders but it would be better to perform the action without even making that choice. 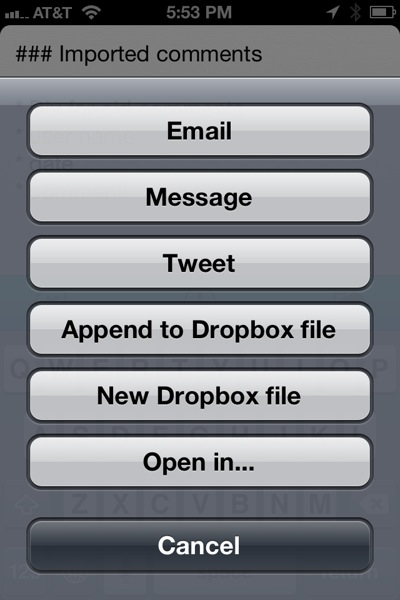 I want to type and then hit one button to append to a Dropbox file or create a new text note. Scratch still requires me to select from the list of recent files. There's no undo function. This is especially bad when some of the shortcuts add significant additional text. Accidentally hitting the inline reference button is a big time waster. Scratch is a superb scratchpad. 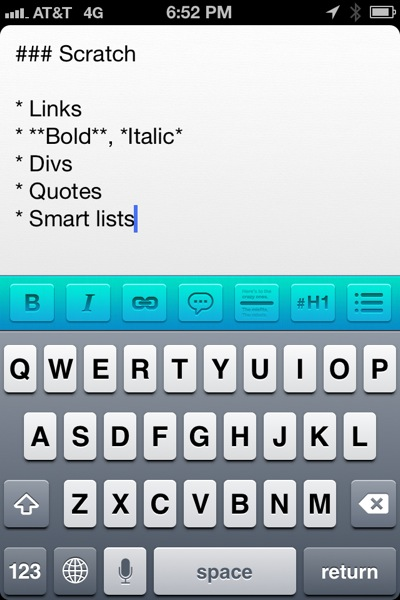 Drafts is the best quick-note app for iPad. Drafts is still a better general purpose app with many more actions and faster sync, but for just jotting down information, Scratch wins by a nose.